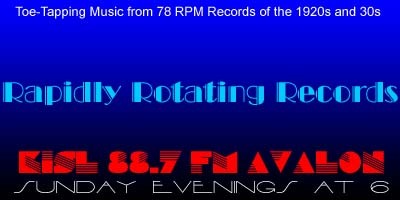 Wecome to Rapidly Rotating Records, bringing you vintage music to which you can’t *not* tap your toes, from rapidly rotating 78RPM records of the 1920s and’30s. No one correctly guessed what the “one thing in common” was among the 16 records on last week’s show, but you can find out what it was by just listening to this week’s show. But the good news is, you still have a chance to win the Peacherine Ragtime Society Orchestra’s CD “Step With Pep.” And the better news is that you don’t have to do anything to win. No questions, no guesses, nothing. Well, other than simply send an email to glenn@rapidlyrotatingrecords.com to let me know that you’d like the CD. Send you email by midnight (Pacific) on Saturday, July 29. A winner will be drawn at random from all the emails received. And your odds are easily better than winning the California Lottery! GOOD LUCK! On this week’s edition of Rapidly Rotating Records, we’re back to our regular five segments and five topics. We’re going to go far away, we’ll find out what’s new, we’ll venture into the dark, we’ll tread lightly and find out what everyone’s doing. Per usual, there are at least a couple of records making their RRR debut. If you enjoy the show, please let us know by leaving a comment on the website or the Facebook page. And remember, your requests and topoic segments are always welcome. As a matter of fact, one of the records on this week’s show is a request. I Found A Brand New Sweetheart – Joe Green’s Ambassadors / Harold Van Emburgh, v.
There’s A Brand New Picture In My Picture Frame – Russ Morgan AHO / Carolyn Clark, v.
Darkness On The Delta – Isham Jones AHO / Eddie Stone, v.
Dancing In The Dark – Waring’s Pennsylvanians / The Three Waring Girls & Chorus, v.
Long Ago And Far Away – Vincent Lopez AHO / Stanley Worth, v.
You’re Too Far Away – Ted FioRito AHO / Muzzy Marcellino, v.
When You’re With Somebody Else – Bernie Cummins AHO / Bernie Cummins, v.
When You’re Smiling – Henry Thies Orchestra / Don Dewey, v.